Ramazan Güveli is Director of Intercultural Dialogue Platform, Brussels. The Turkish government, led by President Recep Tayyip Erdoğan, is waging a ruthless war against the Gülen or Hizmet movement on all possible fronts. Since the failed coup of 2016, more than 160,000 people have been sacked from government offices, and 60,000 have been jailed, of whom at least 17,000 are women, and there are over 700 children in jail. The latest victim of this reckless crackdown is Halime Gülsu, a 34-year-old teacher arrested in February for allegedly helping the Gülen movement, who died in prison last week, as she was not permitted to take her medicines. President Erdoğan and his ministers proudly announce that 83 Hizmet-affiliated people have been snatched from abroad and taken to Turkey. The most recent abduction was of six Turkish nationals from Kosovo, which was roundly condemned by the European Union. Erdoğan, who famously called the coup attempt of 15 July ‘a gift from God’ has held the Gülen movement solely responsible for the putsch without presenting any compelling evidence. The evidence presented to the EU has not convinced one single member yet, which is why the EU states have resisted the Turkish government’s countless initiatives to declare the Gülen movement a terrorist organization. In an interview with EURACTIV, the Turkish Ambassador to the EU shockingly twisted the facts that were presented in the European Commission’s Turkey Progress Report published on 17 April. The ambassador gives readers the impression that the EU has referred to the Gülen movement as ‘FETÖ’, an acronym used by the Turkish government for ‘Fethullah Terrorist Organization’ and that the group is now classified as a terrorist organization. The claim was made by the pro-government media several days before the publication of the report and was flatly denied by the Commission. 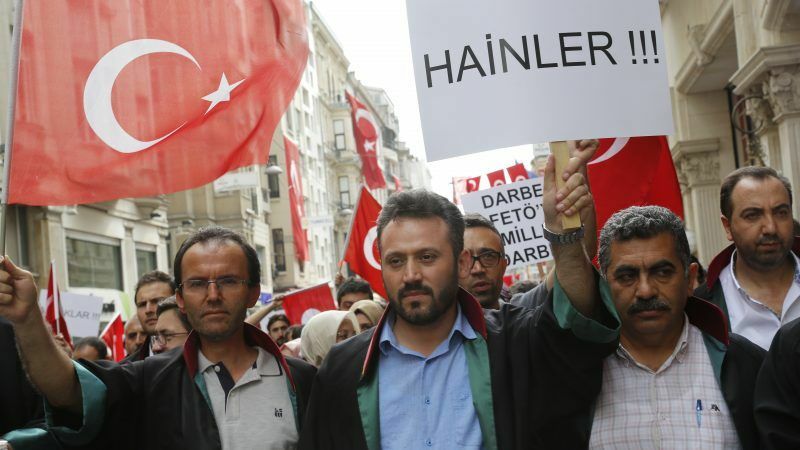 When the report officially became public, it was clear that there was not one single reference to the movement using the pejorative term ‘FETÖ’. To the disappointment of the Turkish government and apparently of the Ambassador, the EU refused to call the Gülen movement terrorist despite all the hard work of the Turkish top diplomat in Brussels. The report makes it abundantly clear that the Commission is not convinced at all to dub the Gülen movement terrorist, whereas it is convinced that Turkey under Erdoğan is making great leaps backwards, away from EU standards and norms. The Commission’s report praises Turkey’s efforts on the migration deal with the EU and for its economic growth. When compared to previous reports, it appears to be written more tactfully to ease the reactions of Ankara on certain issues. Nevertheless, this year’s Progress Report, which is being called by many ‘the regression report’, rightly highlights the serious backsliding of Turkey in most areas of democracy. ‘Backsliding’ is indeed one of the most frequently recurring words throughout the report. It boldly highlights that ‘serious backsliding on the rule of law, fundamental freedoms and freedom of expression’ has been observed. The report also urges Turkey ‘to lift the state of emergency without delay.’ Furthermore, it states that ‘under the currently prevailing circumstances, no new chapters are considered for opening.’ This practically means ‘de facto suspension’ of the accession talks, which is not good news for Turkey’s bumpy journey to membership. As Commissioner Hahn said, Turkey needs ‘to reverse this negative trend in rule of law and fundamental freedoms’ and take positive steps to fulfil EU principles. Despite Ankara’s attempts at blackmail, Hizmet participants will carry on their good work and continue contributing to their local communities and having a positive impact in Europe. If they are educators they will continue to provide the best education to their students, if they are journalists, they will continue to stick to the principles of free media, and if they are involved in any charitable activities they will exert themselves to reach everyone who is in need. Not that i’m a fan of Erdogan but it sounds familiar.